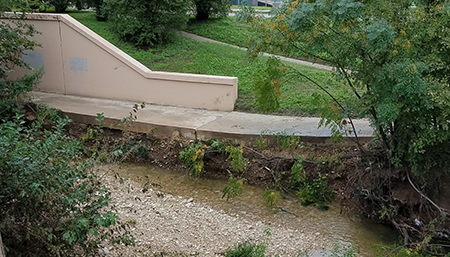 The Watershed Protection Department will be repairing erosion at two locations along the Shoal Creek Trail in the downtown area in 2019. The erosion in these locations is undermining the trail. The repairs will require us to detour the trail. Work to repair the erosion at this spot have been completed. Watershed Protection crews built a grassy shoulder beside the trail and stabilized about 100 feet of streambank with a limestone block wall. The repairs protect the trail and make it safer. 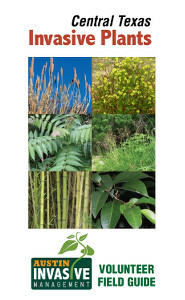 There will be occasional activity for the removal of a stand of Arundo Donax or Giant Reed in this area over the course of the year (2019). Arundo Donax spreads quickly, creating dense stands that choke stream channels and replace native plants. There is also erosion along the trail near 6th Street. 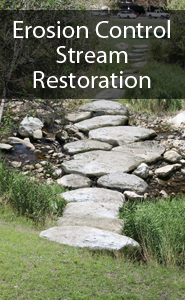 We have plans to build a limestone block wall to stabilize the creek bank and the trail. This work has been delayed due to access issues and should be scheduled at a later date. Please reach out to Charles Kaough, P.E., Engineer C, at 512-974-3397 or by sending an email.